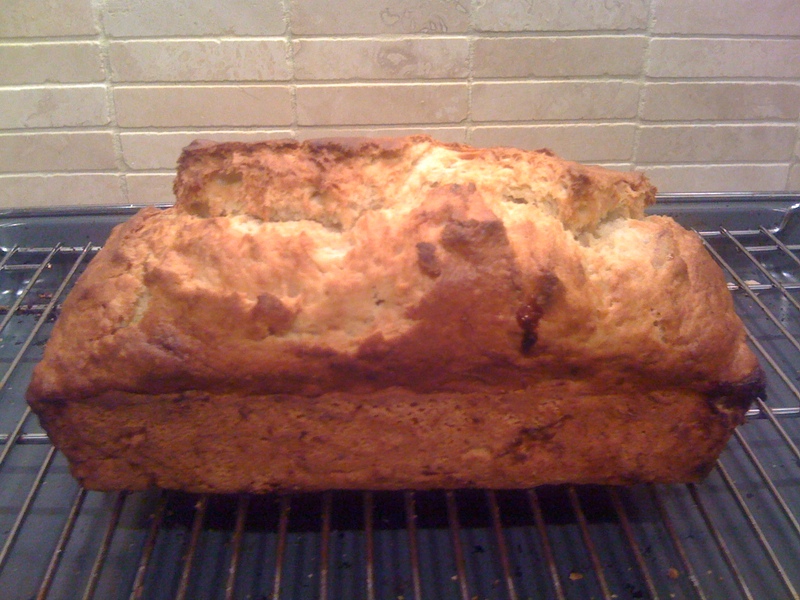 Once again I had a load of un-eaten bananas and so instead of making the usual banana muffins I found this recipe on the internet from Waitrose for a really quick and easy banana loaf/bread. It truly was delish and so easy to make – I’ll certainly be making this again and would recommend it. Preheat the oven 180°C, gas mark 4. Grease a 1kg loaf tin with a little oil, making sure you get into all the corners with a brush. Put the sugar, salt and self-raising flour in the mixing bowl. Make a well and add the egg, milk and melted butter. Mix well. Add the bananas to the mixture and fold them in using a tablespoon. Put all the mixture into the loaf tin, scraping out any left in the bowl with the spatula. Smooth the mixture down with the back of a spoon. Put the loaf on the middle shelf of the oven for an hour. When cooked the loaf will be risen and golden brown. Take it out of the oven and push in a skewer to test if it’s cooked. If there is any mixture clinging to the skewer put your loaf back in the oven for another 10 minutes. Remove from the oven and allow to cool a little before turning the loaf on to a cooling rack. Serve warm, in slices, spread with soft butter. Ooooo it looks yummy… I can almost smell it! !